Machete (Danny Trejo) is back in Robert Rodriguez’s (Sin City, Planet Terror) 'Machete Kills', the thrilling sequel to 'Machete' - and this time he’s on the right side of the law. After losing his partner in a violent sting operation gone awry, Machete is enlisted by the President of the United States to complete a deadly mission that would be impossible for any mortal man. His mission takes him to Mexico, where he must take down Mendez (Demian Bichir), a notorious billionaire arms dealer, and halt his plans to unleash war and anarchy across the planet. This wild ride will pit him against a barrage of ruthless hit men, mercenaries and Voz (Mel Gibson), Mendez’s co-conspirator, who has suspicious plans of his own. Joining his sisters in arms, Luz (Michele Rodriguez) and beauty queen come fatal assassin, Miss San Antonio (Amber Heard), Machete battles his way through Mexico. The 'Machete Kills' competition has now closed. Winners will be announced shortly. Competition opens at 6pm AEDT on Monday 3rd March 2014 and closes at 11:59pm AEDT on Monday 10th March 2014. Five winners will be chosen at random on Tuesday 11th March 2014. To successfully win, entrants must fulfil the above entry conditions before the time the competition closes. Current members/followers are eligible to enter the competition. Only one entry per person. Only one winner per household. To be a valid winner, the entrant must not have won a prize from SWITCH within the last 28 days. Each winner will receive one Blu-ray copy of 'Machete Kills'. By entering, you agree to receive occasional emails from SWITCH in the future. If you decide to unsubscribe from these updates, any further entries will not be applicable. Only Australian residents are eligible to enter. 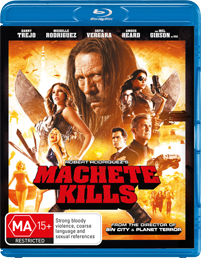 'Machete Kills' is available on Blu-ray and DVD on Wednesday the 12th March 2014 from Icon Home Entertainment.